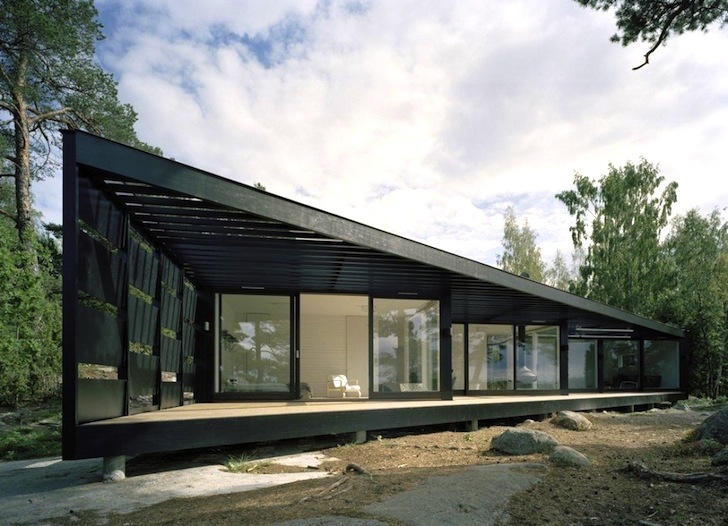 When you dream of the ultimate holiday home in the woods, it probably looks a lot like this pretty black-stained timber Archipelago house in Sweden. Designed by Tham & Videgård Arkitekter to mesh with its beautiful natural surroundings, the project was squeezed in between two big boulders and oriented to make the most of the southerly sun. Archipelago house consists of a compact volume with bedrooms in the back and an open living platform that embraces the surrounding pine forest and sea. Tall glass windows create a sense of interconnectedness with nature and permit plenty of natural light to illuminate the interior, although striking horizontal trellises diffuse this light, softening its impact. 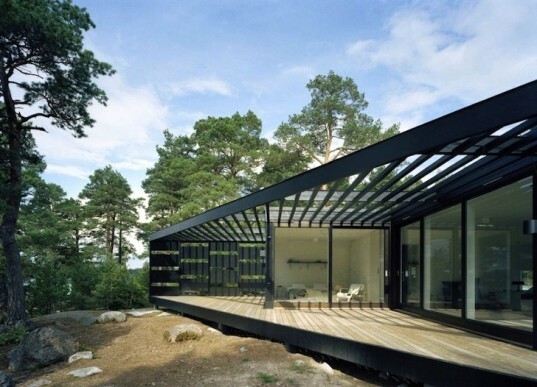 Constructed out of black-stained timber, the Archipelago house has a layered sense of height designed to complement the tall pine trees outside. The interior design is gentle and minimalist yet retains all the comforts associated with a cottage home away from home, and a hanging fireplace keeps the place warm during chilly winters. The rooms are hidden in the back of the house, allowing the rest of it to remain open - like a platform.